I did exactly the same thing. Although I do have a lot of watches, so I don't need anymore in fairness! I ordered one of these last time they were on sale, but I found it to be a little underwhelming in general feel and quality, and a bit on the small side - despite the description saying it was 42.5mm. I suppose it just wears a bit small for me. I'm not voting cold, but I returned mine. Great work . Thank you. 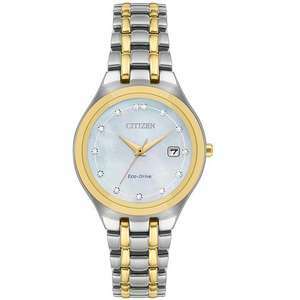 Would you be interested in doing a post for ladies Citizen eco drive watches as well ? ;) Have some heat. 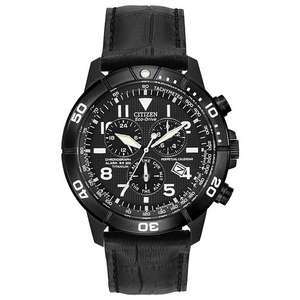 I bought one of the original Citizen Titanium Eco-Drive Pro Master Tough watches back when they first came out. This summer it'll be 20 years old and it's still going strong and has never missed a beat it's whole life. I have a eco-drive since 2005, kept and still keeps great time. 14 years and I had absolutely no problem. Secondary cell is listed as having a 10 year life. The lubricants have 20. So they do not last forever by anymeans but are essinetially maintance free for their entire life. Still using mine. Wear it everyday for work. Strap still strong (why don't more straps have reinforced eyelets?) Still works, still keeps excellent time, some slight scratches on the chrome, strap looking a bit dirty. But still one of my favourite watches. Hello just want to say that I bought this 5 years ago. Has required no maintenance; nothing, nada. Keeps time extremely well. The original strap lasted me about 4 years. Great purchase. The silver fastener? If so not as slim as mine. 1 free adjustment means it goes oval but has some movement. None free = too tight but doesnt roll on my wrist bones. I have 2 eco drives. 1 is about 3 to 4 years old and the other approx 6 years old. Both are ticking along nicely. I was interested in a couple of eco-drives a while back and was picking between the GMT and the Altichron, when I read that the eco-drives commonly become problematic at around 5-10 years old and are expected to die at between 10 and 20 years old. Any long term owners willing to share their experiences? Got it a few months back, great watch. still think the JL edges it for me, prefer the strap. Nice but just bought the JL one on here last week, I can’t buy another ............. or can I!!!!! Mine is brand new, stickers and tags unlike the citizen Ray mears I got from Beaverbrooks. Photo when I get home. Never miss a 'Casio Eco-Drive' deal again! Thanks Op for the deal and everyone's advice. I picked my watch last week and has been getting compliements everytime. 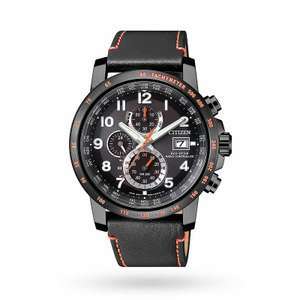 Its a great looking watch and looks and feel more expensive than the rrp. Love ecodrives. My daily watch (ecodrives Nighthawk) is nearly 13yrs old!! That’s a good looking watch. In my opinion it's a great price for it. Ordered one myself. There's no evidence to prove that athletes are fitter now than in the 1950s? Are you sure? (popcorn) In reality diet and science is likely to thank for that though, not smart watches. Not sure to be honest. I have an eco drive with a stainless steel strap but this might look good with leather. You may even like the rubber, but I've always found rubber straps to be cheap and make my wrists sweat. It depends if you kept it charged. It can lose it charge after a while if you cycle between watches and if you keep you watches in a dim-lit environment. Great price, bought the brown version one in 2012 and still ticking away. The only problem is if the Callander is wrong, it takes me like 10mins to correct. Mine arrived today, scratched, dirty and very second hand looking. I can't see how it was even an ex-display model in this condition. I saw that they had described it as rose gold, I would say it’s more gold with a hint of copper rather than pink like Apple’s rose gold iPhone/iPad colour. I'm assuming they're referring to the lugs? I'm pleasantly surprised by the gold, as I'm never in to it, but it seems to work well here. Very pleased with it, better in the flesh. Each time this comes up, I'm so tempted. It's a great looking watch. I've got a similar style Ecodrive, but with a green dial and yellow numerals, that I bought a few years ago. I don't wear it often these days and it just sits on a windowsill so that it stays charged. I hadn't touched it for months since I moved it out of a drawer, but the other day I picked it up and out of interest checked it against my radio controlled weather station. It was just under 5 seconds fast. I was quite impressed, it must be the most accurate non-radio controlled timepiece I possess. 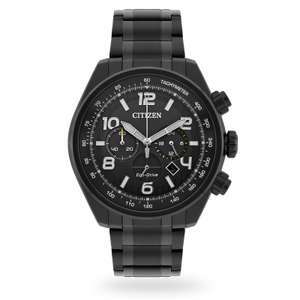 Citizen make very good watches for the money. I've had one of these for more than five years, possibly even ten. It is still working perfectly, the strap hasn't broken, and all in all it is a great watch. Nice watch, great price , shame it’s not a silicon strap. As above, Argos have been selling this watch for £79.99 or less with codes for at least two years. True. If you're genuinely interested I'll message you the letter(s). Yes I would say 10-15 years for a cell. I sent my watch to Citizen directly to be fixed and it was them who told me the cell was no longer manufactured. Another nice watch, though I paid the same or less for the auto version. Cell failure is fairly rare, they usually last at least 10-15 years if not longer. As with anything it's possible to get a bad cell that dies sooner. They take fairly standard rechargeable lithium button cells, albeit sometimes with a soldered tab. With online shopping it's easy to find a replacement; to say the watch becomes junk is lust laziness. I found the part # for the cell in this watch in 30s and then immediately found dozens of examples on ebay and elsewhere. Yes it’s the same model. Great spec watch for the price. Ticks all the boxes except for looks. Not to my taste but have some heat. Not buying it, but I like it. Heat added. Very ugly imo, plus proprietary lugs. Splashproof? .... That’s a tad lame. In fact it’s lamer than a lame thing in a lame competition.